We describe a 7-year-old girl presenting with idiopathic right sciatic neuropathy and transient blood eosinophilia presenting as painful leg who recovered almost completely with conservative management. A 7-year-old girl with a background of early onset childhood asthma presented with an acute exacerbation of her asthma symptoms. Apart from regular low dose inhaled steroids, she was not on any other medications. Both her past medical and family histories are not significant. Her respiratory status gradually deteriorated despite being on intravenous salbutamol, aminophylline, and steroids. She needed intubation and mechanical ventilation for just over 24 hours after which she was successfully extubated and was recovering well. Five days later, she reported a burning pain sensation down the whole of the right leg with some sensory disturbance, which she mainly described as "numbness". A week later, this was followed by weakness of that leg. There was no history of trauma preceding this. Upon clinical assessment, she was noted to have a foot drop with complete inability of ankle dorsiflexion and her right ankle jerk was completely absent. She was only able to mobilize by hopping on her left leg. There was diffuse decreased sensation to pinprick and light touch but mainly from below the right knee to the toes. The rest of the clinical examination was normal. Extensive investigations showed a moderate eosinophilia at 1.35 × 10 9 /L (normal range 0.05-1.0) with normal other blood counts and peripheral smear. Her eosinophilia gradually normalized in about 6 weeks. She had a normal full blood count checked prior to this admission. Concomitant with this, the IgE level was also raised at 391 KU/L (normal < 63). Her mycoplasma antibody (genetic prodrug activation therapy-GPAT) level was slightly elevated but this was thought to be of no clinical significance. The throat swab and the Anti-streptolysin O (ASO) titres did no show any evidence of a recent streptococcal infection. Moreover, polymerase chain reaction (PCR) testing for the common respiratory viruses was negative except for rhinovirus. Her auto-antibody screen including Anti-Nuclear Antibody-Hep 2, Centromere antibody, Monoclonal IgA, IgM, and IgG and subclasses, Rheumatoid factor antibody, were normal. Urine and stool culture were negative and the screening for parasites was negative in stool and blood. MRI demonstrated enlarged and high signal right sciatic nerve on T2-weighted images. This is seen as far down the nerve in the posterior mid thigh as imaged [Figure 1] and [Figure 2]. Neurophysiology examination [Table 1] was limited as she was in extreme pain. The study showed features of right sciatic mononeuropathy probably axonal in nature. The peroneal part of the sciatic nerve was more involved. Electromyography could not be performed at the request of mother; therefore, exact site of pathology was difficult to localize. 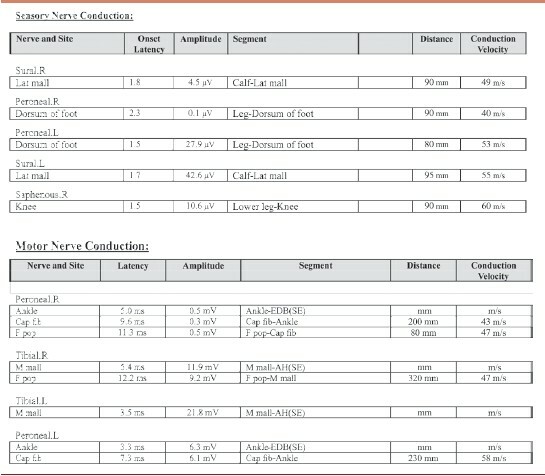 Table 1: Sensory studies showing low amplitude sensory potentials from right sural and superficial nerves. Motor potentials showing reduced amplitude of right peroneal and right tibial motor potentials. Combination of these abnormalities would suggest sciatic nerve pathology. Initially, the patient did have daily exacerbations of severe neuropathic pain, which was quite disabling. The pain only responded partially to trials with multiple agents including gabapentin, opiates, and carbamazepine. Fortunately, the pain started to improve after a few weeks and this was also associated with marked improvement of her muscle power. She continued to make good progress and was able to independently mobilize within 5-6 months. A year later, the patient had made a complete motor recovery, although she is left with an area of abnormal sensation affecting the lateral border of her right leg and the dorsum of her foot. There is a possibility that our patient could have a compressive sciatic nerve mononeuropathy. Of note, a specific compressive mechanism was identified in each of the above 14 patients. All the four sciatic nerve lesions occurred as a result of a persistent posture. The relatively small musculature of the buttocks doesn't offer adequate protection to the sciatic nerve in children, and as a result, immobilization appears to carry an increased risk for sciatic nerve compressive injury in children. Our patient didn't have any prolonged period of immobility and during her pediatric intensive care stay her posture was regularly changed to prevent any pressure sores. Also, previously described cases of compressive sciatic neuropathy didn't have a good recovery, which is again in contrast to our case who made almost complete recovery. Thus, although it is less likely for our case to have compressive neuropathy this cannot be completely ruled out. She doesn't have any tendency (as yet) for repeated nerve palsies necessitating genetic testing to look for 'hereditary neuropathy with liability to pressure palsy (HNPP)', which also remains a possibility and will be looked at if further recurrences do occur. Peripheral neuropathy and eosinophilia have been well described before in the context of 'Eosinophilia-Myalgia syndrome (EMS) ,,] and 'Hypereosinophilic syndrome' (HES). Both these disorders are quite distinct and have mostly been described in adults. Our patient didn't have any myalgia or scleroderma-like changes which are characteristic features of EMS along with weakness and eosinophilia. 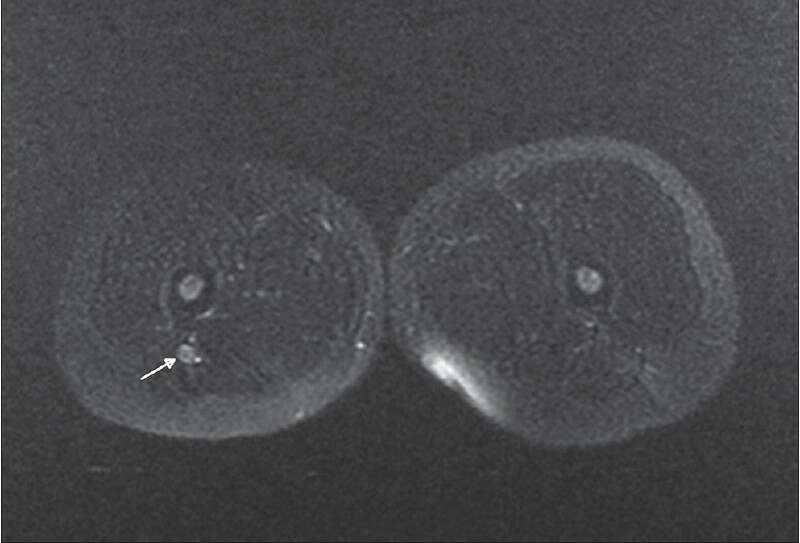 Although, with the background of asthma and in the presence of eosinophilia with peripheral neuropathy, one should always consider possibility of 'Churg-Strauss syndrome' (CGS), this is very unlikely in our index case considering her young age, mononeuropathy and self-resolution of the disease without any course of steroids. Peripheral neuropathy associated with CGS usually presents in late adolescence and adults and is typically in the form of mononeuritis multiplex rather than mononeuropathy , as seen in this case. Interestingly sciatic neuropathy with eosinophilia has been mentioned briefly once before by Srinivasan et al. They described a teenager who developed SN secondary to post-streptococcal vasculitis and had raised blood eosinophils. The duration or level of eosinophilia is not available. He made a good recovery on treatment with steroids and antibiotics. Our patient showed no evidence of recent streptococcal infection, throat culture and anti-streptococcal antibodies remained negative during the course of her illness. It does seem that our patient had amassed a very unusual eosinophilic response to her acute illness in Intensive Care Unit (ICU), but there does not seem to be any evidence of an eosinophilic syndrome and the pattern of recovery is suggestive of a single insult, with slow recovery from axonal damage. Most likely, the sciatic neuropathy in our case appears to be post viral in nature; however, the compressive etiology cannot be ruled out for sure. Hence, the exact mechanism of injury remains unclear and perhaps further accumulation of similar case reports will be necessary to reveal the exact pathomechanisms underlying neuropathies. 1. Jones HR Jr, Gianturco LE, Gross PT, Buchhalter J. Sciatic neuropathies in childhood: A report of ten cases and review of the literature. J Child Neurol 1988;3:193-9. 2. Srinivasan J, Ryan MM, Escolar DM, Darras B, Jones HR. Pediatric sciatic neuropathies: A 30-year prospective study. Neurology 2011;76:976-80. 3. Yuen EC, So YT, Olney RK. The electrophysiologic features ofsciatic neuropathy in 100 patients. Muscle Nerve 1995;18:414-20. 4. Jones HR Jr. Compressive neuropathy in childhood: A report of 14 cases. Muscle Nerve 1986;9:720-3. 5. Heiman-Patterson TD, Bird SJ, Parry GJ, Varga J, Shy ME, Culligan NW, et al. Peripheral neuropathy associated with eosinophilia-myalgia syndrome. Ann Neurol 1990;28:522-8. 6. Burns SM, Lange DJ, Jaffe I, Hays AP. Axonal neuropathy in eosinophilia-myalgia syndrome. Muscle Nerve 1994;17:293-8. 7. Donofrio PD, Stanton C, Miller VS, Oestreich L, Lefkowitz DS, Walker FO, et al. Demyelinating polyneuropathy in eosinophilia-myalgia syndrome. Muscle Nerve 1992;15:796-805. 8. Bell D, Mackay IG, Pentland B. Hypereosinophilic syndrome presenting as peripheral neuropathy. Postgrad Med J 1985;61:429-32. 9. Chusid MJ, Dale DC, West BC, Wolff SM. The hypereosinophilic syndrome: Analysis of fourteen cases with review of the literature. Medicine (Baltimore) 1975;54:1-27. 10. Hattori N, Ichimura M, Nagamatsu M, Li M, Yamamoto K, Kumazawa K, et al. Clinicopathological features of Churg-Strauss syndrome-associated neuropathy. Brain 1999;122 (Pt 3):427-39. 11. Case records of the Massachusetts General Hospital. Weekly clinicopathological exercises. Case 18-1992. Asthma, peripheral neuropathy, and eosinophilia in a 52-year-old man. N Engl J Med 1992;326:1204-12. 12. Srinivasan J, Escolar D, Ryan M, Darras B, Jones HR. Pediatric sciatic neuropathies due to unusual vascular causes. J Child Neurol 2008;23:738-41. 13. Socan M, Ravnik I, Bencina D, Dovc P, Zakotnik B, Jazbec J. Neurological symptoms in patients whose cerebrospinal fluid is culture- and/or polymerase chain reaction-positive for Mycoplasma pneumoniae. Clin Infect Dis 2001;32:E31-5. 14. Yoshino H, Inuzuka T, Miyatake T. IgG antibody against GM1, GD1b and asialo-GM1 in chronic polyneuropathy following Mycoplasma pneumoniae infection. Eur Neurol 1992;32:28-31. 15. Wendling D, Langlois S, Lohse A, Toussirot E, Michel F. Herpes zoster sciatica with paresis preceding the skin lesions: Three case-reports. Joint Bone Spine 2004;71:588-91.